The duties of the Plumbing Inspection Division of the Warren County Health District include plan review for new plumbing in commercial and residential buildings, inspection of the plumbing work through all phases of construction, and final approval of the plumbing work prior to occupancy. The Plumbing Inspection Division is responsible for protecting the water supply by ensuring, through plan review and inspections, that the plumbing has no cross-connections or possibility of backflow. The plumbing inspectors are also responsible for ensuring the waste plumbing is properly vented and trapped so the plumbing safely carries waste away while causing no health problems. The Warren County Health District employs five State of Ohio Certified Plumbing Inspectors. By law, only State Certified Plumbing Inspectors can inspect plumbing work. The plumbing inspectors are responsible for plan review and inspection of all residential commercial plumbing work whether it is a remodel or new construction in Warren County. In addition, to the aforementioned duties, the five plumbing inspectors provide technical consulting services to homeowners installing their own plumbing. They also work closely with the Environmental Health Division on plumbing related problems in restaurants and grocery stores. When filling out your permit application, backflow test sheet and/or homeowner’s bond please fill in ALL information. See the examples if you have any question. All forms must be mailed in or brought to the office with proper payment to insure they are processed in a timely fashion. If you need a Permit Application, please stop by the office or call us to have one mailed to you. It must be submitted on the original yellow paper. A backflow prevention device is used to protect water supplies from contamination caused by a backflow situation which may be caused by a loss of water pressure. In municipal water supply systems, water is normally maintained at a significant pressure to enable water to flow to and out of the plumbing fixtures in your home or business. When the pressure drops for some reason such as may occur when the fire department connects to a fire hydrant to fight a fire or a water main breaks or some other situation happens, contaminated water may be drawn into the system. To prevent such an occurrence, there needs to be some type of backflow prevention method utilized. The best and safest type of backflow prevention is an air gap ( a physical separation between the water outlet and the rim of the fixture). If an air gap is not possible, then the proper backflow prevention device is required. This backflow device is considered a “containment” backflow preventer and is regulated by the Ohio Environmental Protection Agency and your water supplier. Section 312.10 of the Ohio Plumbing Code covers the installation, repairs and testing of isolation backflow preventers (BFP) and Section 608 of the Ohio Plumbing Code addresses protection of the potable water supply within a building these devices are known as “isolation” BFP. Again, the best type of backflow prevention is an air gap, such as the outlet of a faucet and where water would flow over the rim of a sink or bathtub. 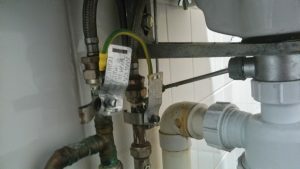 The Warren County Plumbing Department checks to ensure there is an air gap, if there is no way to provide one, then we check to see that the proper BFP device is installed. These BFP’s, if testable, are required to be tested (by a certified backflow preventer tester) upon installation and at least every twelve months thereafter. Call 513-695-1220 between 7:00 – 8:30 AM, Monday-Friday, to Schedule Inspections. Office Hours are from 07:00 to 09:00 Monday-Friday.